What Does Code P0488 Mean? A stored code P0488 means that the powertrain control module (PCM) has detected a discrepancy between the actual position of the exhaust gas recirculation (EGR) valve and the desired throttle position. The PCM uses input signals from the throttle position sensor (as well as the vehicle speed sensor and other engine sensors) to determine the desired percentage of EGR valve activation at any given time and under a particular circumstance. 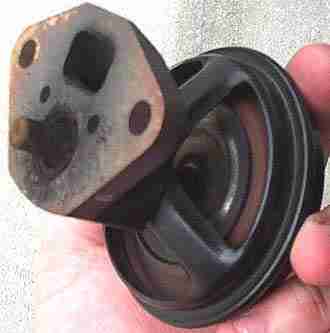 There are two basic types of EGR valves; linear and vacuum diaphragm. Both types are controlled by the PCM in different ways. The linear EGR valve is opened using one or more servo motors that are directly attached to the EGR pendulum. The PCM not only controls EGR valve function, it also monitors manifold absolute pressure (MAP) and exhaust oxygen content to determine whether or not the EGR is functioning properly. Some EGR valves are also equipped with valve position sensors which reflect (to the PCM) the percentage in which the valve is actually opened. 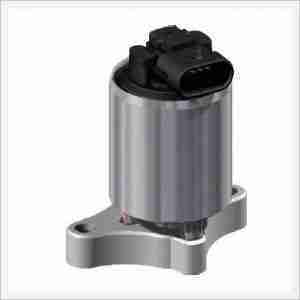 The vacuum diaphragm EGR valve is also controlled by the PCM but engine vacuum is used for opening. Typically, an in-line (intake vacuum) vacuum control solenoid is provided a voltage signal when the engine is running. When the PCM deems that EGR operation is feasible, a fluctuating ground is applied to the solenoid; causing it to open and allow a percentage of engine vacuum to reach the EGR valve. The EGR valve should open accordingly and the PCM looks for MAP changes that reflect such. The typical TPS is a potentiometer that is moved along with the throttle plate. A five-volt reference circuit is completed by the TPS. As the throttle plate is opened, sensor resistance decreases, allowing circuit voltage to increase. The PCM recognizes these variations in TPS voltage as changes in throttle position. TPS signal voltage normally ranges from .5-volts at idle to 4.5-volts at wide-open throttle. As the PCM monitors changes in MAP and exhaust oxygen content (in relation to the EGR system), data is compared to the throttle position sensor. Variations between perceived EGR system performance and TPS position, over a set period of time, will result in a stored code P0488 and possibly an illuminated malfunction indicator lamp. What are the common causes of code P0488 ? What are the symptoms of code P0488 ? How do you troubleshoot code P0488 ? I would gain access to a diagnostic scanner, a digital volt/ohmmeter (DVOM), a hand-held vacuum pump, and a reliable vehicle information source (All Data DIY is a great one) to diagnose a code P0488. I would begin with a visual inspection of EGR and TPS related wiring harnesses and connectors. I would pay particular attention to high temp hoses for the DPFE sensor for the EGR (if applicable). Consult your vehicle information source for related technical service bulletins. If there are any, use the information to help in your diagnosis. Connect the scanner to the diagnostic port of the vehicle and retrieve the stored codes and freeze frame data. Writing this information down may prove helpful later. Now clear the codes and test drive the vehicle. If the P0488 code is reset, accompanied by other EGR related codes, test EGR system efficiency. If the vehicle has a linear EGR valve, use the scanner to activate the EGR valve and observe the appropriate data inputs to determine if it is functioning properly. The vacuum diaphragm EGR valve can be tested using the hand-held vacuum pump. With the engine started and idling, disconnect the vacuum hose from the EGR valve and apply the appropriate amount of vacuum using the hand-held vacuum pump. With vacuum applied to the EGR valve, the engine should stall. 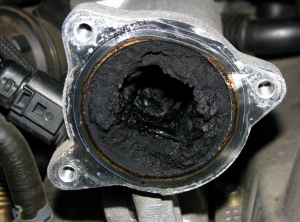 If it doesn’t, suspect a defective EGR valve or clogged EGR passages. Clogged passages are far more common than faulty EGR valves. To determine whether the EGR valve is bad or the passages are clogged, turn the ignition off; remove the EGR valve and apply vacuum to it. Look and see if the pendulum is opening when vacuum is applied. If it is not, the EGR valve is defective. If the pendulum is open, start the engine. The engine should stall due to the massive vacuum leak caused by the open EGR port. IF the engine idles normally, you have clogged EGR passages. EGR passages can be cleaned in several different ways, consult your vehicle information source for the manufacturer’s recommended method. If the code is reset, accompanied by other TPS codes, use the DVOM to test TPS signal voltage. With the DVOM test leads connected to the appropriate circuits (see the vehicle information source), observe live data while actuating the throttle plate. Voltage should steadily increase as the throttle is opened and decrease as the throttle is allowed to close. Voltage should increase and decrease through the entire throttle curve without glitches or hiccups. If it doesn’t, replace the TPS. None found. Ask a question about P0488. The wrench light comes on every now and then. Code read stored po488 code stored.